Analysts have come to believe that S&P 500 companies failed to grow earnings during the just completed first quarter. Moreover, the forwards market for short-term interest rates sees no further U.S. rate increase on the horizon. Global bond markets are, once again, priced with negative yields in Germany, Japan, Spain, and France. The U.S. Treasury curve is flirting with inversion, where long-term rates fall below short-term rates, which can be a recessionary signal. Despite this backdrop, investors returned to equities in the first quarter of 2019. Undoubtedly, the International Monetary Fund will weigh in on the state of global growth when they meet this week. It is likely they will highlight the negative impact that trade tensions have had on their outlook. We also expect to hear a good deal about a slump in European activity. Last week, we saw that the IHS Markit Eurozone purchasing manager’s index plummet to 47.5 in March from 49.3 in February, the largest drop in six years. Consistent with that reading was Germany’s February manufacturing report which had orders down 8.5% year-over-year. The last time orders fell by this amount was at the start of the 2008-2009 recession. Europe is undergoing a significant growth downshift from where they were a few months ago. 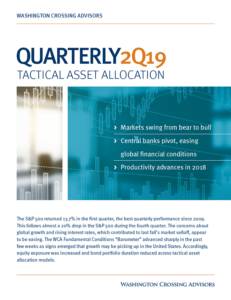 For our part, we recognize that global growth was slower early in 2019 than a year ago, and therefore, less likely to reach our 3.5% long-run target this year. However, we could be starting to see some signs of firming in the United States’ and Chinese economies. For example, the U.S. Institute for Supply Management said its monthly index of manufacturing activity rose to 55.3 in March from 54.2 in February. Order rates were especially strong which augurs well for future domestic production. Similarly, an official Chinese purchasing managers index rebounded to 50.5 from 49.2 in February, jumping to a six-month high. An upward bias to commodity prices also suggests some expectation of better global growth ahead. Since last summer, China cut taxes, lifted spending, and eased monetary conditions. For its part, the Federal Reserve also completed an about face regarding their stance on U.S. monetary policy — convincing markets that no further rate increases are in the offing. Speculation that a trade deal between the United States and China might be struck soon is also engendering a sense of hope that global growth could soon lift. The net effect of all this is an easing of financial conditions and a more bullish environment for stocks. 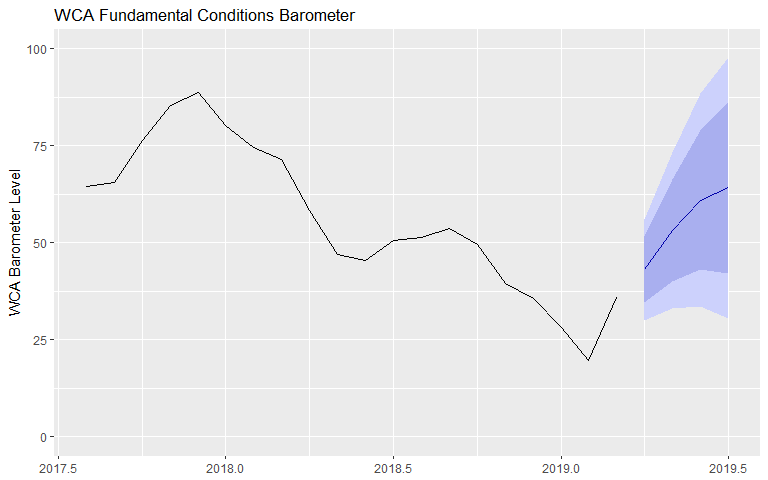 After months of slippage, our WCA Fundamental Conditions Barometer (chart A, below) spiked in March. Our near-term forecast path for the barometer is centered near 55 (see chart). 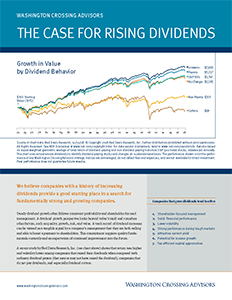 Therefore, equity exposure has been increased to 55% from 35% in the satellite portions of Conquest Tactical ETF Portfolios. After months of slippage, it is possible that the outlook for global growth just might be approaching a turn for the better. Tactical positioning around a potential for improvement in the months ahead lead us to lift equity exposure to a modest overweight.